Since the business model for my website is predicated on advertising revenue where I presently run Google AdSense Ads, the following chart is especially interesting to me. Furthermore, since I am leveraging social media networking to promote my website, the Facebook advertising results are particularly relevant. Data is from a Webtrends survey of more than 11,000 Facebook advertisements. The Google AdWords program considers 2% to be a good CTR. However, competitive ads will get a lower CTR due to many players offering ads for the same thing - with many available ads, each individual ad will get less attention. The banner ad is diminishing in popularity for a variety of reasons. 0.25% to 0.5% CTR is the current metric. Video ads may get 1% to 2% CTR which is also in decline as the novelty of ads in videos is wearing off. 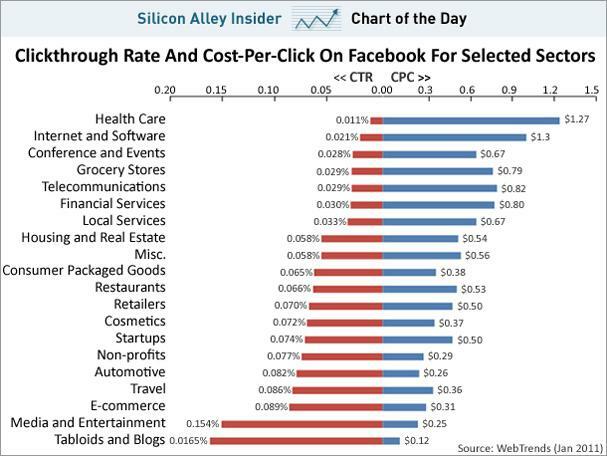 0.25% CTR is considered good for Facebook ads. Cost-Per-Click (CPC) is the what the advertiser pays the publisher for each click of an ad. Competition drives up CPC. In this case, Facebook is the publisher. The chart of survey results shows that Facebook users are more receptive to click on ads for blogs, media and entertainment than health care. I find Internet and software ads surprising for its lower interest ranking. Perhaps the Internet and software is "old news". Even though the CTR is relatively low, the sheer number of Facebook users (see Awesome Facebook Statistical Facts) means many ad impressions are served and when ads are clicked, the CPC is counted towards Facebook's revenue. Related articles: Advertising Revenue Website and Internet Advertising Revenue.